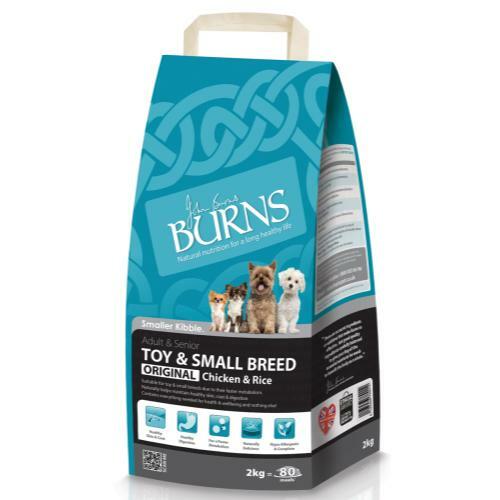 Burns Original Chicken & Rice for toy & small breed adult dogs caters to the complete, specific nutritional demands of your canine companion. Equally suitable for adult and senior dogs thanks to a carefully controlled mineral content, Burns provides small and toy breeds with the comparatively higher levels of protein and essential fats which they require in their diet as a result of their higher rate of metabolism. Free from frequent sources of irritation such as wheat, gluten, beef, and dairy, as well as artificial colours and flavours, Burns is highly hypoallergenic, helping to reduce occurrences of itchy or flaky skin, stomach upsets and wind, bad breath, and excessive moulting, instead promoting the production of friendly intestinal bacteria for prime digestive function, and helping to maintain glorious, luxuriant coat.